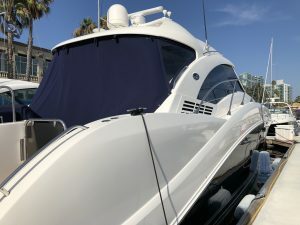 The Sea Ray 550 Sundancer is actually an updated version of the company’s earlier 540 Sundancer with a revised interior, a restyled hardtop, and and overhead skylight to add some natural lighting to the salon. This yacht’s luxurious two-stateroom layout is highlighted by its beautiful high-gloss cherry woodwork, a long, curved ultra-leather sofa to port which can be electronically converted into a slide-out bed and a curved galley to starboard. We did mattress, Sferra sheets, coverlet and shams for this client. 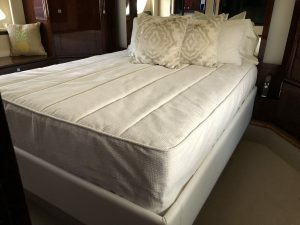 This client chose our 7” Commodore Latex mattress. The Commodore is by and far our most popular model. Constructed with a 6″ Latex core and covered in an ultra-soft bamboo quilting, it is all about comfort. 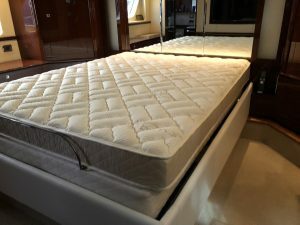 The benefits of a latex mattress include being mold and mildew resistant, extremely comfortable, latex helps regulate body heat, which allows you to sleep cooler and it is bendable and breathable. You have a choice to make it Soft, Medium Firm or Firm. We make everything custom. Each boat mattress is crafted to fit the unique size and shape of your berth. Each boat mattress we make is crafted custom in California and built to stand up to rigors of a marine environment. We used our Sferra sheets here. For percale lovers, nothing compares to the crisp, cool feeling of bed linens woven in a simple, plain-weave style and that’s what Sferra is all about. Visit our website to view our entire Sferra Collection. Along with Sferra Sheets, we used our Off the Grid fabric for the coverlet and shams. One of my favorite house fabrics, smooth yet textured with a beautiful natural tone of neutrals. Our coverlets fit the size of your bed, are quilted with a medium weight batting, have a piping trim edge and a drop to give a beautiful custom look. This bed had an adjustable frame so we also did a custom skirt. Along with coverlets, your other option can be our custom duvets or our wide range of blankets that can be used as bedspreads too. Our custom duvet covers bring the perfect amount of color and comfort to your stateroom. Mix and match fabrics from our fabric collection to get the perfect look. Our custom duvets are down alternative, low to medium loft that provide comfort and warmth without the bulk. On the other hand, your choices are endless when it comes to our blankets. Matelassé Interlaken, Saturday quilt, soft fleece blankets, our silken quilted coverlet and not to forget our Sferra blanket collection. Our choices and limitless when it comes to bedding but our goal is to keep the selection process as simple as can be for our clients. For that reason, we always recommend you give us a call so our design team can answer any questions you have and help transform your stateroom into your dream room.